We publish news and other announcements in the News section of this web site, as well as on our Facebook page when appropriate. Media, partnership and brand-use inquiries may be made to our media director, as described below. Whether you are an employee of Van’s Aircraft, an agency tasked with helping us promote our brand, a media outlet, a distributor or a customer, we appreciate your commitment to ensuring that the Van’s Aircraft logo is always reproduced in accordance with the usage guidelines we’ve established. 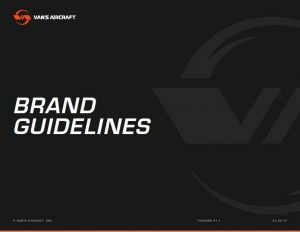 The Brand Guidelines document provided below outlines in detail the acceptable use of the Van’s logo and mark. It also describes examples of unacceptable use. The following downloads are provided for use as outlined in the brand guidelines document. Commercial use of the Van’s Aircraft brand and trademark on items or services for sale is expressly prohibited unless you have obtained prior, written agreement and permission for use from Van’s Aircraft. Use of the logo/mark to represent the brand in media, on customers’ RV aircraft and in similar locations should follow the guidance in the provided document. Do not alter the logo/mark, as we have described in the below document.